Microcaps are small emerging companies. The smaller the company, the more you are betting on the founder, CEO, and management’s ability to execute on their vision for the future. If your goal is to find great companies early, you need to find great leaders early. Charlie Munger refers to great leaders and great business builders as Intelligent Fanatics. We wrote two books on Intelligent Fanatics and now have a community devoted to studying them at IntelligentFanatics.com. 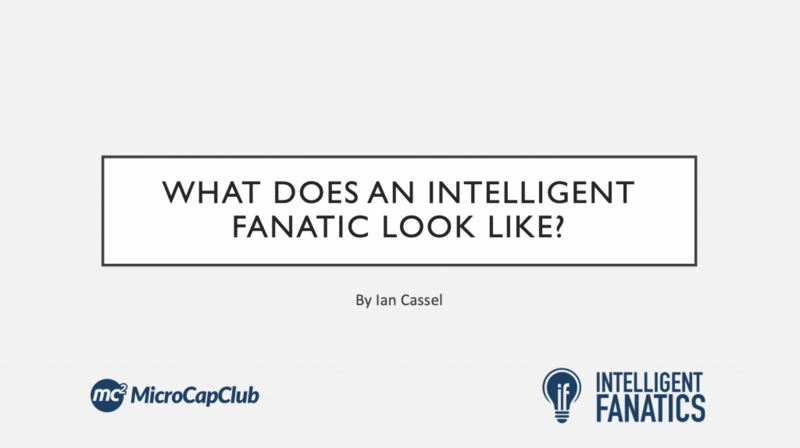 For a while now I’ve been wanting to focus and present my thoughts on how to apply intelligent fanatic principles to investing, specifically microcap investing. I finally did so when Jatin Khemani was kind enough to invite me to present at the Indian Investing Conclave in June 2018. Jatin and his team have been kind enough to publicize this presentation. I hope you enjoy it. You can view it [HERE] or by clicking the image below. Thanks George. Glad you enjoyed it. It is interesting to note that I’ve been working for four years in a company that the Management Board has similar traits as those shown in your presentation and the growth results (especially cash flow and net income) have been increasing at a good rate when compared to our competitors, which many of them in the past years have gone bankrupt. Some topics are really thoughtful and I ended up writing seven pages of concepts and ideas during the presentation. Keep up with the excellent work! Thanks Paulo. Glad you enjoyed it.